Apartment 90 sqm in villa with garden and spectacular view of the lake from 450 € for week. Wi-Fi for free. Property 3: Apartment 90 sqm in villa with garden and spectacular view of the lake from 450 € for week. Wi-Fi for free. Property 5: CHARMING GLICINE HOUSE AT GRIANTE - CLOSE TO " LA VECCHIA TORRE BAR PIZZERIA"
Ca 'dei L'Era de Sott - With breathtaking views! Property 6: Ca 'dei L'Era de Sott - With breathtaking views! Property 9: The Country House. We had a lovely time during our three week stay. Maurizio and his wife Rosa were very friendly and accomodating from the moment we arrived. The village of Massino is a great location to explore the wonderful Valtelina region, and enjoy the culinary delights, the area is known for its Valtelina red wine, delicious. 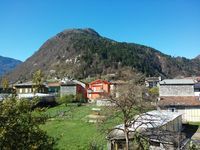 Some of our highlights included, visting Val di Mello (highly reccomend), Strada del Vino and wine tasting or just visting one of the Agriturismos along the way. Frattoria del Didattica petting zoo in the mountain, And for a day trip spend the day on the beach lake on the Novata Mezzola lake. Maurizio showed us where the rock pool was on the nearby river on the first day, and we returned at the end of the day to cool off. The village Massino and Ardenno (10 minute walk) have all the basics of a supermarket, and bank, cafe, etc. The nearby Spa supermarket also has fresh bread every morning. We could use the bicycles to explore the village and surrounding area. Our two kids (3 and 7) both loved playing in the garden which is nice grass garden with some Little Tikes garden playhouse and slide. We also Barbequed many nights and enjoyed the evening sun with Aperol Spritz. Everyone in the village is very friendly, and Maurizio has many family which allows you to really practice your conversational Italian if you want, including his cousin next door who is a bee keeper. He showed us his shop and we had honey tasting which the kids loved. We bought some of his honey on the last day to take home. It was delicious.